To keep your real estate email subscribers engaged, you need to make sure the information you are sharing is relevant to their concerns. The best way to do this is by segmenting your subscriber list according to their interests and demographics, then creating different versions of your real estate newsletters to appeal to each segment. Typical divisions include commercial or residential properties; family status (families with children, singles, and couples); and urban or suburban preferences. More than half of all email users now check their email using a smartphone or mobile device, so if your real estate email newsletter can’t be accessed easily on mobile, your clients are going to hit the unsubscribe button in a hurry. That will destroy your chance to stay top of mind with real estate clients. Choosing responsive design for your emails is the best course, because it ensures that your real estate newsletter will look good even as new devices are introduced. Your subject line is the “hook” for your real estate emails, so make sure you come up with something that makes your clients want to click! Create short subject lines that include a direct offer or discount, and try to create a sense of urgency while still describing the email content accurately. Featuring one or two gorgeous, full-color photos of your featured properties or neighborhoods is a great way to get your real estate newsletters noticed. So go ahead and make the most of our beautiful surroundings – showcase some stunning beach sunsets and views from the homes you’re selling! 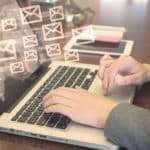 For more tips on email marketing for real estate agents along with full support for all your online real estate marketing strategies, you can always turn to For Sale Marketing. Our dedicated real estate marketing team provides professional email writing services, responsive real estate website design, social marketing services, branding packages, and much more. Contact us at For Sale Marketing today at 954-779-2801 for more real estate email marketing tips along with full support for all your marketing strategies to ensure your real estate agency’s success!